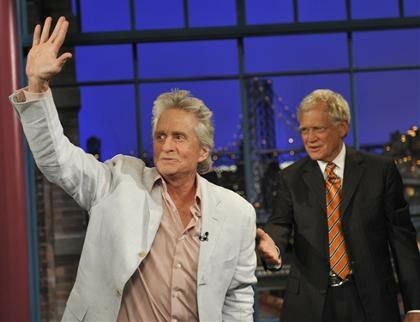 Actor Michael Douglas revealed his stage 4 throat cancer diagnosis on the Late Show with David Letterman on Tuesday evening. During his interview, Douglas reported that he had a walnut sized tumor at the back of his tongue that was diagnosed as cancer 3 weeks ago. He said that although he had been complaining to doctors about severe throat pain form some time; it was only when a doctor physically spotted the tumor than a diagnosis of cancer was made. A stage 4 cancer has spread beyond the initial site to the lymph nodes, nevertheless, Douglas appeared optimistic about his chances, saying that he had an 80% survival expectation and explaining that although the cancer had progressed beyond the throat, that it had yet to move below the neck. Douglas said that he is now 1 week into an 8 week radiation and chemotherapy regimen to treat the cancer. Although appearing buoyant and positive on the show, Douglas admitted that the treatments wore him out and that he battled pretty intense throat pain at times.